Emil Dean Peeler was born and reared in Sacramento, California, the third son of the late Arlie and Thomasina Peeler. He attended Oakwood University and is a graduate of Loma Linda University (Bachelor of Arts), Andrews University (Master of Divinity), and Claremont School of Theology (Doctor of Ministry). He shares his life with his wife, Brenda, and three young adult daughters; La Donna, Nicole, and Alisha, and one grandson, Jeremiah Emil. For over 33 years, Dr. Peeler has served in various positions of leadership in the body of Christ and broader community-most notably as pastor, conference evangelist, author, associate ministerial director, college professor, executive director of Westside Brighter Vision Foundation, and director of Church Growth and Evangelism of Southeastern California Conference. He has served in the role of senior pastor at Compton Community SDA Church (Compton, CA), Sixteenth Street SDA Church (San Bernardino, CA), Maranatha SDA (San Diego, CA), and Dupont Park SDA in Washington, DC. 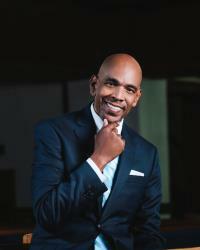 In July of 2016 he returned to Washington DC and was installed as the senior pastor of the Capitol Hill SDA Church where the Lord has recently led the congregation to acquire a $1.9 million property to further the churches outreach initiatives. Additionally, he is engaged as an international evangelist and as Adjunct Professor at Washington Adventist University in Takoma Park, MD. © Copyright 2019, Capitol Hill SDA Church, All Rights Reserved.